Add a bit of Victorian elegance to two places on your wall using these Esschert Design Aged Brown Cast Iron Hanging Basket Hooks. The striking scrollwork and extended arm on these 2 units lend wonderful style to them, while the distressed brown finish contrasts your flowers. A small, downward curl near the end of each arm creates a fantastic, functioning hanger, accommodating items up to 16" in diameter. Hand cast from hardy, cast iron, these brackets bring a bold look to your indoor or outdoor wall, and two openings on the back plate of each make installation easy. Place two of your existing hanging baskets at perfect display heights using these Aged Brown Cast Iron Hanging Basket Hooks. 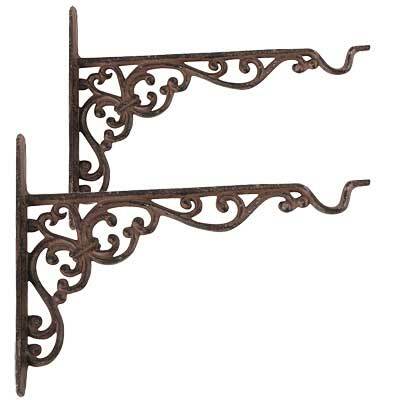 Note: This package contains 2 of the Esschert Design Cast Iron Hanging Basket Hooks, Aged Brown.